Despite all the changes in CEO compensation over the last 10 years, today’s complaints about executive pay packages are louder than ever. Magazine covers last spring vilified CEOs for boosting their own paychecks while eliminating thousands of jobs. And the matter wasn’t lost on politicians this election year: During the primary campaign, candidates argued that bloated CEO pay packages create social dislocation. Recently, we even overheard young bank executives-with $200,000 average salaries-complaining about their own CEO’s bonus, even though the company’s stock price had increased 63 percent in 1995. The reality is that today’s compensation committees have done an outstanding job of aligning CEO pay with company performance. Chief Executive’s 10th annual survey of CEO compensation indicates that in 1995, the link between pay and performance was stronger than ever, as compensation committees followed the orders of institutional investors, shareholder activists, the SEC, and Congress. According to our survey, which analyzed the annual reports and proxy statements of 222 public companies in 16 industries, CEO pay packages now rely more heavily on stock-based incentives, and CEOs face increasing downside risk in their pay-as well as upside potential. Since quite a few CEOs were big winners in 1995, pay critics countered with misguided solutions to what they see as a “crisis.” Their proposals include capping CEO pay as a multiple of average employee pay, limiting the tax deductibility of executive compensation expense, creating exorbitant marginal tax rates, and-silliest of all-transferring voting rights from pension and mutual fund trustees to individual participants. These solutions would have the unintended consequence of diluting the relationship between pay and performance. Compensation committees bid up CEO pay levels unintentionally because of flaws in the most popular methodology for calculating competitive long-term incentive levels. In many companies, CEOs and non-CEOs compete for compensation in a win-lose, zero-sum game, which discourages trust, teamwork, and empowerment. Shareholders gain negligible motivational benefit from the excess compensation they shower on the CEO. They would get a better return by redirecting it to other value-creators in the organization. The CE survey indicates that companies increasingly are aligning CEO pay with company performance. To measure this, we’ve developed a Leverage Index that gauges the sensitivity of CEO earnings to company stock-price fluctuations. Compensation committees should aim for a Leverage Index of at least 2.00-meaning that if a company’s stock price doubles, so does the value of the CEO’s pay package. In 1995, 134 CEOs-more than 60 percent of the total sample-had a Leverage Index of 2.00 or higher the best showing since we began tracking the statistic in 1989. Only 46 CEOs (21 percent) had a Leverage Index of 1.50 or less, compared with 61 low-leverage CEOs (28 percent) in last year’s survey. Michael D. Eisner, chairman and CEO of Burbank CA-based Walt Disney Co., heads the list of winners. Most commentators focus on his cash compensation of $8.8 million. They ignore the tremendous financial risk he took (and continues to take) by concentrating his personal wealth in Disney stock and options. That risk clearly paid off in 1995: Since the Walt Disney Co.’s shareholder return increased 48.9 percent in 1995-highest in the industry and almost double the median of 26.7 percent-Eisner’s stock-related wealth increased by $207 million. Some critics cite Eisner’s wealth as evidence that CEO pay has gotten out of hand. But that viewpoint ignores the fact that risk has its downside. 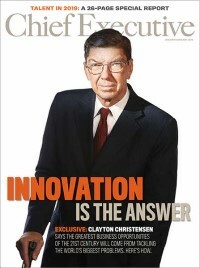 Consider Henry H. Hoyt Jr., CEO of New York-based Carter-Wallace. Hoyt beneficially owns about half of Carter-Wallace’s outstanding stock. In fiscal 1995, the company lost 41.5 percent in return. Hoyt’s company-derived wealth declined by $213 million, despite his cash compensation of $1.6 million. Of the 196 CEOs in both this year’s and last year’s survey, 33 percent (65 CEOs) experienced declines in total cash compensation, with the size of the declines averaging 15.9 percent. Some 26 CEOs in this year’s survey earned no bonus in 1995, often because the company had unacceptable financial performance. Even more dramatic, 73 CEOs (or 37 percent) experienced declines in total performance pay (cash compensation plus the value of long-term incentives), averaging 26.3 percent less than a year ago. pay (from about $3.2 million to $3.9 million). Digital’s shareholders enjoyed a 109.0 percent return in 1995, and Palmer received a 42 percent increase in cash compensation (from about $900,000 to $1.3 million) and a 307 percent increase in total performance pay (from about $1.9 million to $7.9 million). Big losers included James A. Unruh of Blue Bell, PA-based Unisys, whose total cash and total pay declines of 34.9 percent and 26.2 percent reflected his 1995 shareholder performance of -36.2 percent. A handful of CEOs have turned around failing companies, created enormous amounts of shareholder value, and reaped huge rewards. But most CEOs have not performed as heroically. Why has their pay grown so much? Many companies rely on surveys that calculate competitive long-term incentive amounts as multiples of base salary. These multiples dramatically overstate competitive long-term incentive levels for CEOs and other highly paid executives. By using them, compensation committees waste pay leverage on CEOs, while undermotivating the value-creators in the organizational trenches because so few shares are available after the CEO and senior executives receive their “competitive” grants. The compensation survey consultants ignore the extent to which the multiples distort “competitive” CEO pay. When a company hires an outsider as CEO, it often awards him or her a special sign-on grant of options or restricted stock. This serves many purposes, such as jump-starting the CEO’s equity position, immediately aligning his or her interests with the shareholders’, buying the CEO out of unvested long-term incentives at a previous employer, or inducing him or her to accept the offer. But even when the surveys spread these awards over a few years, they inflate the competitive pay numbers. The widespread use of the BlackScholes option valuation methodology also bids up CEO pay levels. In the BlackScholes methodology-designed to value short-term tradable options, not long-term compensation options-option value is positively correlated with stock-price volatility. Stock-price volatility can be a sign of a poorly performing company. Yet these are precisely the companies that are likely to make larger grants to the CEO and senior management (to compensate for the risk of the payout), thus further inflating the competitive multiples. Stock-for-cash exchanges also boost the multiples. Many CEOs take salary or bonus reductions in exchange for additional stock options or restricted stock. Examples include Anthony Luiso of Minneapolis-based International Multifoods; H.B. Atwater Jr. of Minneapolis‘ General Mills; T. Milton Honea Jr. of Houston‘s NorAm Energy; and Arnold G. Langbo of Kellogg’s of Battle Creek, MI. These stock-for-cash exchanges cause the salary multiples in the surveys to rise (even though the CEOs’ total pay opportunity has not changed), again escalating competitive pay levels for CEOs. Most seriously, though, too many compensation committees rely exclusively on the salary multiples when deciding on CEO option grants. This approach ignores the nature of the business, its unique strategic position, and the company’s competitive environment. 1) While senior management retains responsibility for making the company’s key strategic decisions, the work takes place in the trenches-and so does the creation of shareholder value, which depends on growth instead of just cost-cutting. 2) Shareholders benefit when the value of their investment grows, regardless of how much of the pie they control. 3) Value-creating employees are more portable than ever, so companies must invest in them if they wish to keep them, regardless of where they are in the organizational hierarchy. The new Equity Allocation Model has three basic steps. First, the board establishes an equity allocation philosophy that answers the question: “How should we allocate equity between shareholders and employees?” Two issues determine the answer: the type of business the company is in, and where it is in the organizational life cycle. For example, an asset-intensive business might follow the traditional 1 percent rule (that is, grant options each year equal to 1 percent of shares outstanding), because value is created primarily by those investing their financial capital in the hard assets. A software, consulting, entertainment, or financial-services company, on the other hand, might allocate 20 percent or even 30 percent of equity to employees, because most of the value is created by those investing their intellectual capital. For example, employees at New York-based Morgan Stanley own more than 35 percent of the company’s outstanding shares. A company’s position in the organizational life cycle also helps influence the board’s equity allocation philosophy. New companies usually distribute considerably more equity to employees than mature ones do. Turnaround situations-such as Chicago-based UAL Corp., parent of United Airlines-often require a shift in equity allocation from shareholders to employees. This is one of the major reason for UAL’s move to majority employee ownership. In Step 2, the compensation committee apportions the employee share of equity among the CEO, the senior management team, and other value-creators. In the world of salary multiples, this is done sequentially: first the CEO, then the other executives, with the remaining equity (if any) for other employees. In the Equity Allocation Model, the compensation committee determines all three portions simultaneously. Smart compensation committees do what is right for their company’s unique situation. The critical questions are: Where does the organization create value? How much is created through leadership and vision (the CEO); strategic and operational planning (senior management); and tactical implementation, product development, and customer service (other employees)? In Step 3, the compensation committee and the CEO develop programs for distributing equity, based on the allocation decisions in Steps 1 and 2. Consider New York-based Travelers Group, which has three linked programs that build employee equity. First, its five top executives-the CEO and his most senior lieutenants-receive a portion of their annual bonus in restricted stock, which vests after three years. Under its Capital Accumulation Plan, each bonus-eligible employee also receives a portion of his or her annual bonus in restricted stock. The converted portion increases as the individual’s cash compensation increases, with a maximum conversion of 25 percent of bonus for those earning at least $600,000. The restricted stock vests in three years, as long as the employee is still an employee of Travelers, and it is “purchased” at a 25 percent discount to market to reflect the illiquidity and forfeiture risk of restricted stock. Chicago-based Sara Lee Corp.’s equity programs combine widespread employee ownership with programs that link employee equity allocations with company performance. The share ownership guide lines apply to CEO John H. Bryan-who is required to hold stock equal to five times his annual salary ($922,000 in 1995)-and another 500 employees whose share ownership targets start at two-thirds of base salary. Like many other companies, Sara Lee bases the size of its annual option grants on the number of shares outstanding. Unlike most others, though, it adjusts the option pool according to the year’s earnings per share performance. This approach prevents the dilution of outside shareholder value (but not their total ownership percentage), because increases in earnings-per-share typically boost the stock price. Thus, employees increase their share of company ownership when they outperform the company’s plan, resulting in a win-win situation for outside shareholders, CEO John Bryan, and all other employee-option holders. CEO pay critics are not completely wrong when they rail against extraordinarily high pay packages-even when outstanding company performance supports them. But instead of proposing misguided solutions, critics should attack the real culprit: the over-reliance on salary multiples for determining CEO option grants, which ensures ever-increasing CEO pay levels and declining equity opportunities for all other employees. Today’s forward-thinking compensation committees are approving ways to increase equity opportunities for all employees-not just the CEO because they know that in the era of reengineering and growth, employees outside the executive suite are creating more value than ever. CEO pay data for the most recent fiscal year were analyzed from annual reports and proxy statements for a sample of 222 companies that represent a cross section of small, medium, and large companies, and low, medium, and high performers in 16 separate industries. Our analysis is based on the CEO who has held office the longest during the company’s fiscal year. Competitive Pay is calculated through regression analysis (“lines of best fit”), comparing revenues with CEO pay for each company in an industry group. Options are valued using the “extended” binomial method. We adjust this calculation as follows: We discount option values 25 percent for illiquidity and for the risk of forced early exercise following termination. We discount the option value 5 percent per year over the weighted average vesting period to reflect forfeiture risk. If the proxy statement does not disclose vesting, we assume an average vesting of three years. Restricted shares are assigned face value, discounted 5 percent per year for the weighted average vesting period to reflect forfeiture risk. If the proxy statement does not disclose vesting, we assume five years. Performance units and performance shares are valued at target, discounted to reflect forfeiture risk like restricted shares. If performance shares are at maximum, we discount an additional 25 percent for performance risk. This valuation approach captures the expected value of long-term incentives at the time of grant. Pay Factor is the percent difference between Actual and Competitive Pay. Performance Factor is determined by subtracting the median Industry Performance from Company Performance. Return Above/(Below) Industry is the difference between the growing market value of the company at the Company Performance rate versus the Industry Performance Rate. Pay Above/(Below) Competitive is the dollar difference between Actual and Competitive Pay. Pay Premium (Penalty) per $100 in Performance is calculated by dividing Pay Above/(Below) Competitive by Return Above/(Below) Industry/$100. NM relates to companies in which pay and performance are not aligned. Linkage is absent. Leverage Index is the ratio of Actual Pay assuming a 15 percent annual stock-price growth rate, and Actual Pay assuming a 0 percent annual stock-price growth rate. CEO Capitalization Index is a measure of ownership calculated in the same way as the Leverage Index, except that the numerator includes the appreciation in value of all options and shares held. Jack L. Lederer is president of and Carl R. Weinberg is partner in, COMPO Consulting Group, a Westport, CT-based management consulting firm specializing in strategy, organizational effectiveness, and compensation.